It's almost the holiday season! Thanksgiving is next week and before you know it, it will be Christmas then New Years! Speaking of Thanksgiving, Black Friday and Small Business Saturday are coming! Don't forget to stop in and see the awesome deals we have in store and support small businesses the community. We will be open Friday and Saturday 10-7. We still have classes available and are looking for input for our classes for next year, let us know if you're interested or have ideas! We have lots of exciting promotions going on in store that we want you to know about! 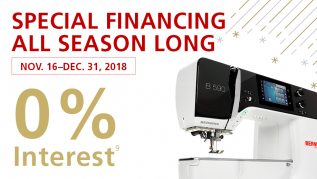 First, now through the end of the year Bernina is offering 0% financing for 48 months on machines $3,000 and up. This is a great time to upgrade or buy a gift for someone else. Secondly, in honor of Thanksgiving, November 20-26, the B 215 is on sale for $599 and the B 330 is $799. The third promotion is November 27-December 10, and does include the special financing we have going on! $500 off of 5 Series machines, $700 off 7 Series, and $800 off 8 Series machines. Now if 48 months is not long enough, December 5-10, we are offering 0% for 60 months on machines $3,000 and up! The best promotion is happening December 11-17, all bernette machines are 25% off. These little machines are the same great quality as the Berninas but are easier to use for beginners and easy to take to class. Pick one up for a loved one as a special Christmas present! We're also taking T-shirt quilt orders, price varies on number of shirts and amount of work involved.